← Laptop – “First Aid” if you get water on it ! They replace the sound card built into your laptop, providing replacement headphone/speaker and microphone sockets. Being on a USB connection, they can of course be used with desktop PCs, but are ideal for laptops/netbooks because of the high cost and hassle of replacing their built in sound card (where it’s possible). 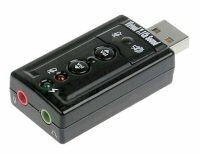 Click here BUY ONE GET ONE FREE USB2.0 External High Quality 3D 7.1 Channel Audio Sound Card Adapter for MIC to view one currently on sale for less than £5; however more expensive ones may give better quality. Posted on December 16, 2014, in Tips and tagged adapter, faulty, headphone, laptop, microphone, netbook, ports, sound, speakers, usb slot. Bookmark the permalink. Leave a comment.